Detail King's car wash mats for water containment are ideal for every aspect of auto detailing. 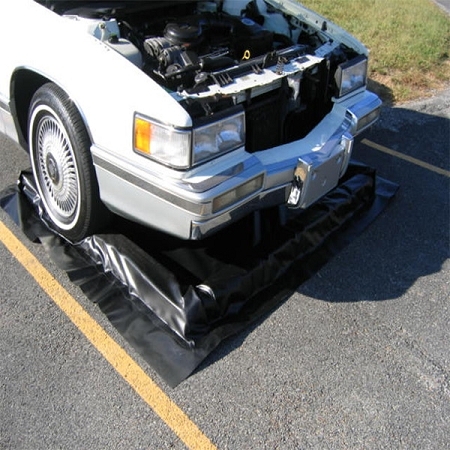 Whether you are a professional auto detailer or car enthusiast, our Engine Compartment Water Containment Mat is an excellent car wash accessory to use to contain dirty and greasy engine compartment water runoff. Excellent mat to use whether you are providing low pressure eco friendly engine washing or using a power washer. Our mat is constructed of commercial grade super-tough vinyl and has an encapsulated 4" foam berm. The foam berm can be driven on, driven over or just used to contain the dirty wash water. 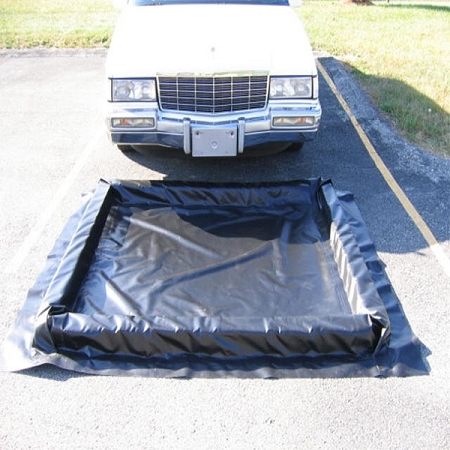 This 5' x 4' mat can be positioned underneath just about all sized cars, pick-up trucks SUV's and mini vans to contain the engine compartment wash water. It only weighs 15 pounds and can be easily folded and stowed, becomes very compact once folded up. Don't loose those valuable profitable revenues by not providing engine shampooing services. Our Engine Compartment Water Containment Mat will allow you to do that! Just vacuum up the wash water with a shop vacuum or one of our water reclaim equipment systems then properly dispose of it.